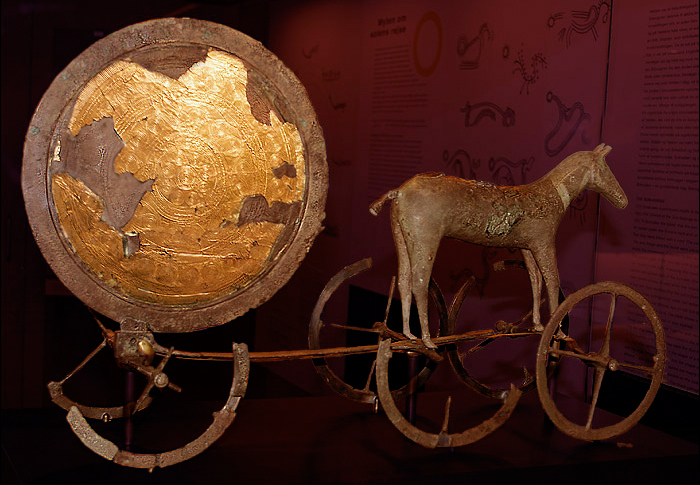 The Trundholm Sun Chariot – a possible representation of Nerthus? The Sun is personified as the feminine Sól in Scandinavian legend. The account is obviously second or third-hand and apart from its broad observations, the details should be treated with caution. The description of a peregrination through the provinces, and the sanctuary associated with water and the sea all fit with the descriptions of the later Norse god Njörðr, yet modern scholars have remained confused by the masculine aspect of Njörðr, perhaps misunderstanding the ‘otherworld inversion principle’. Tacitus’ picture is actually one combining the opposing twin principles Njörðr and Jörð – sea and earth.